I’m currently in the process of setting up a new craft studio to corral all of the projects that have slowly begun to take over our house. The intention was to create a space for “mommy’s projects,” but it quickly caught the interest of my little ones. 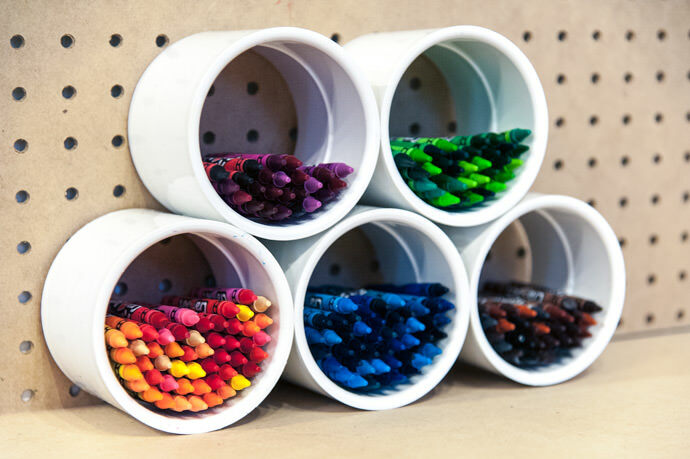 What could be cooler than a room filled with art supplies? It quickly became clear that keeping the kids out of mommy’s craft supplies would require setting them up with a few of their own. I decided to set up a space for the kids in the studio and then headed off to the the starting point for all projects of this nature, Home Depot. The desk works well as a standing workbench or can be used with just about any stool or chair. The five gallon Home Depot “Homer” bucket is inexpensive and makes an ideal stool for a child working at the desk. It also serves double duty by providing plenty of room inside for storing craft supplies. 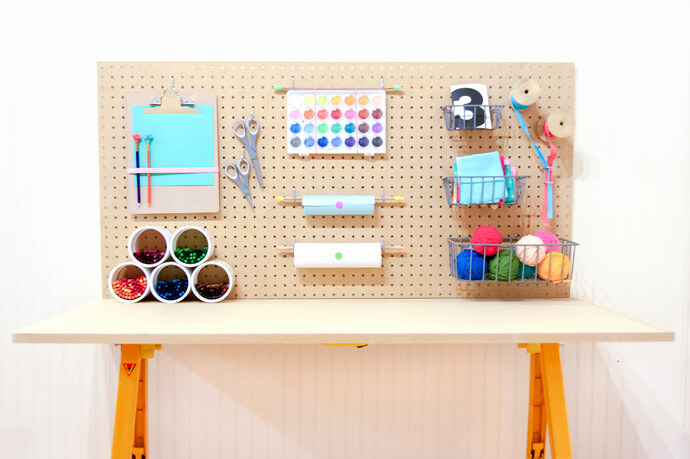 Here’s a basic shopping list and instructions for the craft station if you’d like to build one of your own, as well as instructions for building a simple craft storage cubby using PVC pipe. Everything you need can be found at your local Home Depot store. Attach the MDF panel to the adjustable sawhorse with wood screws. Place the desk against the wall in the desired location, first locating the wall studs for mounting the pegboard. 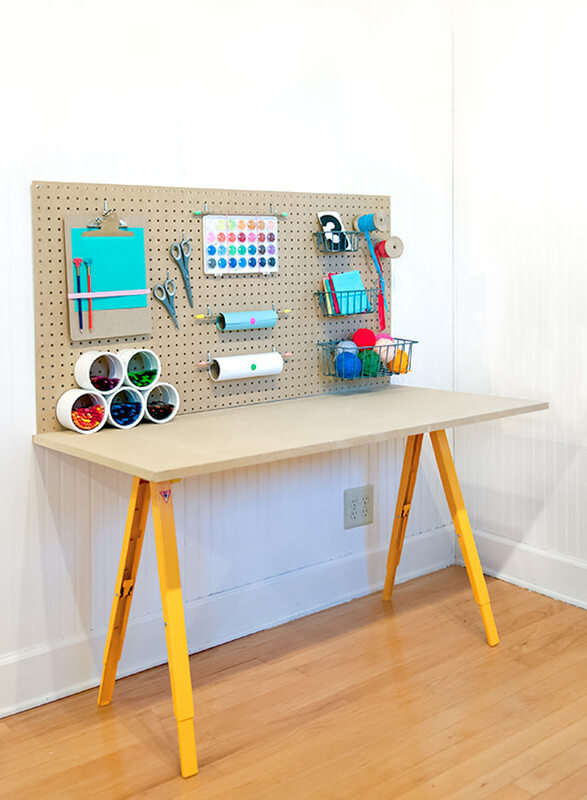 Mount the pegboard to the wall using wood screws. Don’t forget to use spacers with the mounting screws to allow room for mounting accessories. Decide on the layout for your cubbies, heat up your gun and glue them together. It doesn’t get much simpler than that! Let me know how everything turns out if you decide to give either of the projects a go! This post is sponsored by The Home Depot. More Saving. More Doing. This is brilliant! Love the PVC Storage idea and all the creative little organizing touches. So clean and modern. I’d craft there! Totally awesome. So creative and still usable even after the kids outgrow it. 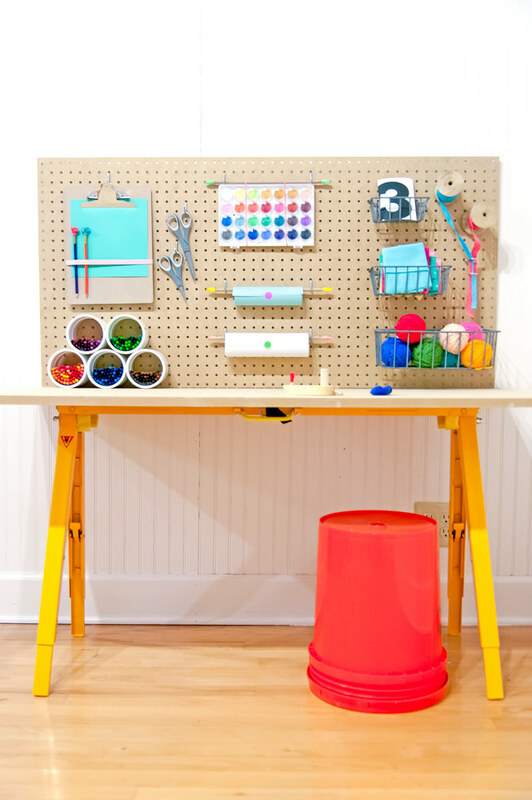 I think it’s so fun how the desk can sort of “grow” with your kids because of the adjustable legs on the sawhorse! Love it. I love it! That its affordable and used unexpected pieces like the pvc pipe. thanks for the inspiration! I think I would have hinged the board to the wall, and then supported it with the horse. That way you could get more room in a cramped area. We’re so excited about this desk! My kids are actually flipping out about it. They love all the little compartments. Home Depot has some really cool little shark clips that i’m crushing on too! Forget the kids. I want one of these! This is super adorable! & perfect for anyone!!! I’m in love with this little station! The legs are adjustable–so this could work for everyone. You could go nutty with the PVC! I want to make an entire wall for markers as well. Great idea! Thanks for popping in! All of my children want one now! Awesome! I would have LOVED this setup as a kit! Aw that’s so cute… I want one for me!! Always wanted a peg board! I love this, especially the PVC storage. Every time I go down that aisle my mind races with projects just waiting to jump into my cart. And I need to be following you. I just realized I’ve pinned most of your other articles on this page. something to remeber for my own craftroom! So colorful and OCD-friendly! This is good to remember for the big kid craft corner of my dreams. This is so great! Just yesterday was going through all of my daughter’s art and craft supplies and I was totally overwhelmed with how much we have accumulated – much less trying to organize it! I couldn’t have found your post at a better time. Thank you so much!! You’re awesome! I love Craft Gossip! Ohhh I loved the rolls too!